A few hours ago Newsarama reported that Wizard World was canceling Wizard World Los Angeles and Wizard World Texas. Wizard later issued a press release saying that WWTX was “cancelled,” [sic] but that WWLA was “postponed.” The Beat has some commentary as well. I’ve attended the last two shows in Los Angeles (see: WWLA 2007 writeup; WWLA 2008 writeup & photos), though I haven’t been to WWTX. I enjoyed both, though I only went for one day each year. It was in some ways what San Diego was for me back when I was in high school: a con to drive out to for the day and look for/at interesting stuff. Admittedly Wizard World was a bit overly-focused on promotion compared to other cons I’ve been to, but that didn’t seem like a big deal on the floor. There were problems, mostly to do with poor communication: schedule updates weren’t posted anywhere that I could tell except in front of the panel rooms themselves. Some events required tickets, but didn’t say so in the program. Artists’ tables weren’t labeled, so if you didn’t know someone by sight and they hadn’t brought their own display, you might walk right past someone you were looking for. Whenever I would read anything online about the con, everyone kept talking about how dead it was. 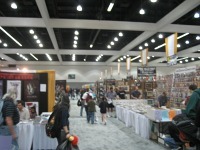 To me, the (relative) lack of crowds was a good thing, because I could walk around freely and got to spend time talking with writers and artists (I must have spent at least 15 minutes talking with Peter David and J.K. Woodward last year). Still, I figured its days — or rather, its years — were numbered, and eventually I’d hear that Wizard World was canceling the show. I didn’t think they’d wait until only two months before the show, after they had announced guests and started selling tickets. This year I wasn’t sure whether I’d attend Wizard World LA. On one hand, it is the only major comic convention that I can really do as a day trip. On the other, I’m already going to San Diego and WonderCon… and this year, WWLA is only two weeks after WonderCon. And I wonder if that’s part of the problem: scheduling. In good traffic, Los Angeles is 2 hours from San Diego and 6 hours from San Francisco by car. It’s going to draw from a similar pool of extended “locals.” March is far enough from July that San Diego shouldn’t be a big problem, except for people who only do one big con a year, but it’s right next to February. Last year it was three weeks after WonderCon. This year it was only two. Maybe they figured they’d find a time that’s a little less crowded? I actually wouldn’t be terribly surprised to see Wizard World Los Angeles rescheduled for November, taking WWTX’s old place at the tail end of the convention season. Meanwhile, comments on the Newsarama thread have pointed me to a new small monthly convention in the LA area, the Los Angeles Comic-Con in Claremont. I’ll have to check it out and see how it stacks up against the ~bimonthly Los Angeles Comic Book and Science Fiction Convention (the one at the Shrine), which is pretty much just a dealer’s room and a single track of programming. 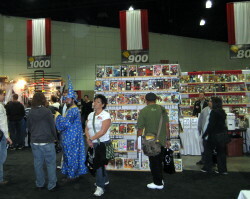 This entry was posted in Fandom, Opinion, Timely and tagged Cons, Wizard World, WWLA, WWTX on January 9, 2009 by Kelson.